Holiday Style at Gymboree + Giveaway! We are officially creeping into the holiday season and it’s about the time that you need to have your holiday wear picked out and ready to go. Who is prepared? I am kinda ready. From the start of Thanksgiving through the New Year, we tend to have a handful of fancy events that Miss H attends with us. Of course, I’m that mom who doesn’t wear things twice for big events, so we have to really plan ahead. This means Thanksgiving ( 2 of them), Friendsgiving, Pictures with Santa and Christmas Eve and Christmas Day. So many cute outfits and I love that we can find what we are looking for at Gymboree. This year the Gymboree Holiday Collection is adorable. We were so excited with Gymboree reached out to us to see how Miss H would style her holiday wear. She’s told us that she gets to wear this outfit to church on Sunday. Probably a little over dressed for a Sunday in October, but definitely an option in December. Let’s start with this Bow Jacket. How darling is this? 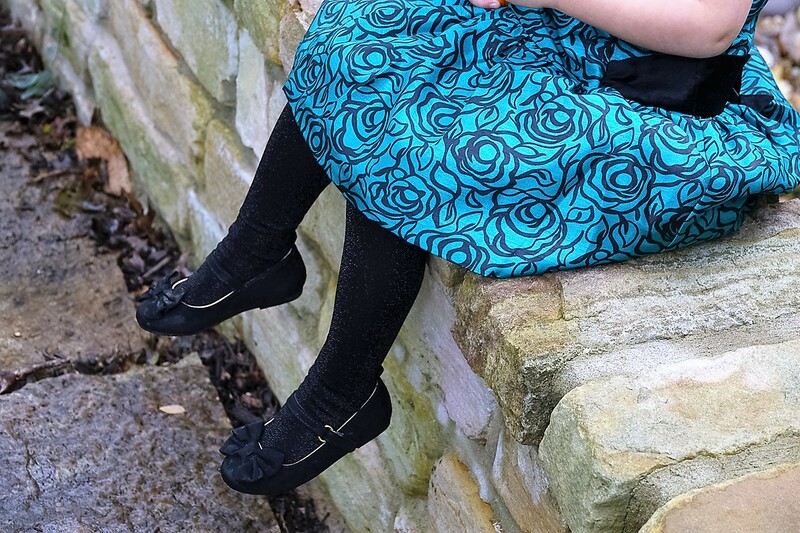 The thing I love about Hattie’s style (which is really my style…but don’t tell anyone) is that she can rock a pair of leggings, roll in the dirt but then still wear her big bows and frilly dresses. She’s the perfect combo. This jacket just cried out Jackie O to me, and knew she needed it in her closet. While black isn’t probably a traditional toddler color, I love the versatility of it. Paired with a dress for church, or even jeans and boots, she’ll be one trendy toddler. If this came in my size, it would be in my closet immediately! Her dress is the Duppioni Dress. How darling is the floral pattern? The drop waist with the velveteen bow and extra tulle underneath make the bottom extra fluffy and perfect for twirling. Let’s not forget her classic beret. Her whole outfit just cries French Girl in Paris – maybe even a little Madeline. 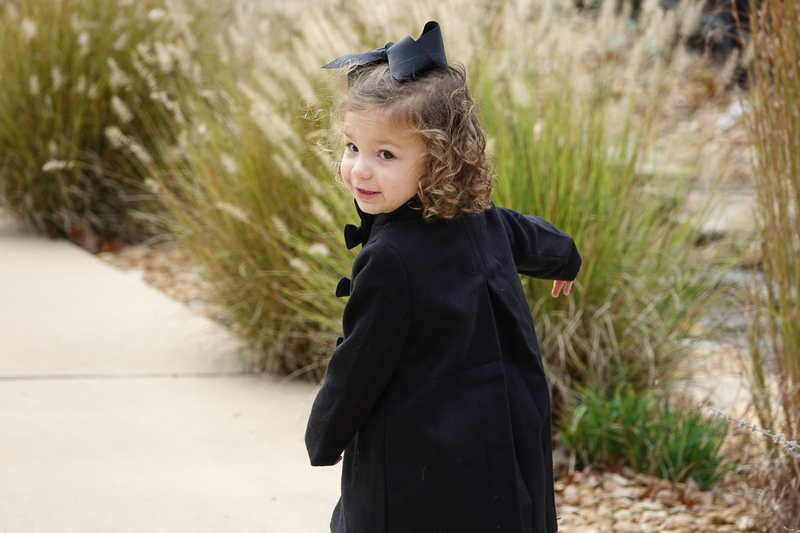 Of course, we had to pair her out fit with her classic signature jumbo bow. We paired her dress with the Sparkle Tights and Bow Shoes. See a bow trend going on yet? We’re at that stage where Miss H has become quite the accessorizer on her own. She loves the glittery bangles (she calls them Tangles) and matching Bow Purse. She insisted on picking all the flowers and tucking them in her purse. I am so excited to show of Miss H’s fashionable choices at one of our holiday events. Now we just have to decide where she is wearing it! I do know that Bow Jacket will be making an appearance all winter long. It’s too adorable to hang in a closet all winter! The thing I love more than anything about Gymboree is the quality of their clothing. As a mom, I feel confident knowing that Miss H is looking her best and her clothes will last for more than a couple of wears. This dress is classic and will last for quite a while or until she grows out of it! I’m so excited to be teaming up with Gymboree for a $50 Instagram Giveaway! Head over to my Instagram and enter! Be sure to follow Gymboree too for all the latest is fashionable wears for your kiddos! Thanks again to Gymboree for help show how Miss H loves to style herself for our holiday fun! Head over to Gymboree and tell me what holiday outfit you’d love to see your kiddo in this holiday season! What do you typically dress up for? Does that coat come in my size?!?!? She's such a cutie!! Holy smokes?! She is just the cutest. The hat. The dress. Those curls. Okay, how precious is your sweet girl?! I adore these photos of her!